There has been quite an uproar since the release of hidden camera video of abuse at a nearby factory dairy farm, and thank heavens for that. It means people are becoming aware of this very real issue, and that’s where change starts. 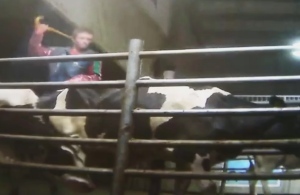 I’ve watched more than my fair share of animal cruelty videos and the clips released from the Chilliwack factory farm are bad, but not even close to as graphic as how bad it gets. When I watched Earthlings while visiting my mom a few years ago, I barred her from entering the room while I watched it, tears pouring down my cheeks. From the doorway, her forehead creased in concern, she asked why I watched it if it was so upsetting. I didn’t want those images burned on her brain, but “Someone has to, we need to know the truth.” I felt it was a painful but necessary eye-opener. CAUTION: Graphic images, viewer discretion advised. I’ve written here at LocalDelicious.com about other related footage, including I Lost My Appetite Watching Our Daily Bread and Supermarket Secrets but I haven’t written about those kinds of things in a while. Mostly because I don’t watch those kinds of videos much anymore. It’s not because I don’t care. It’s because I care too much. It broke my heart and left me feeling overwhelmed and powerless. On some level we ALL know there are serious issues with the treatment of animals in the food production industry. We can’t be faulted for not wanting to think about it when it leaves us feeling bad. support them, and tell others about them. One of the first places to start, if you want to join me in building the momentum of change, is your local farmers market. Stop in, meet the people producing the food, find out how they’re doing it and whether you can ethically support it. Start small, with a single purchase. One drop in the ocean. There are lots of us joining you, more every day. I didn’t watch the video. I’m far to sensitive to watch cruelty. We started buying organic milk many years ago. Do you think that means the cows are treated better? You ask a great question, one we should all be asking, “What exactly does the organic label mean?” We can easily be fooled into thinking it means a pastural setting that harkens back to Little House on the Prairie days, but as we learned with Organic Eggs and Factory Farming, that is not always the case. With respect to dairy, farms are inspected, but an inspection is only as good as the regulations it is meant to adhere to. Canada’s regulations (scroll down for the details) cover access to outdoors, quantity and quality of grazing, feed and supplement quality, allowable medications, minimum acreage per animal and other health and welfare criteria. As for general welfare and handling, it’s a bit worrisome that the documentation refers to “guidelines” rather than standards. I did a little more digging and found this document that compares standard factory farming, BC SPCA and BC Certified Organic regulations with respect to animal welfare and handling: http://www.spca.bc.ca/assets/documents/welfare/farm/StandardsComparison_May2007.pdf. I’m glad to see that these requirements are more specific, but a lot is still left up to interpretation. What does “Animals must be treated humanely, but no specific requirements” mean?